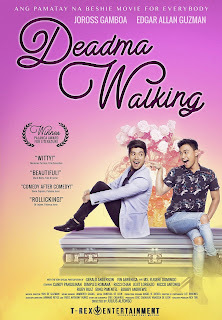 Deadma Walking is 2017 Musical Comedy Drama, Starring Edgar Allan Guzman, Joross Gamboa, Dimples Romano, Candy Pangilinan, Nico Antonio. Directed by Julius Alfonso and Produce under T-Rex Production. Deadma Walking is an official entry to the 43rd Metro Manila Film Festival. 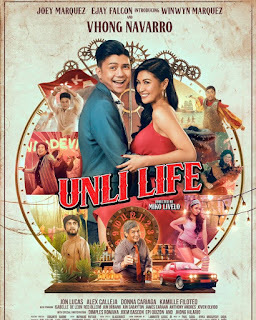 The film tells the story of a terminally ill gay, John (Joross Gamboa) who enlists the help of his best friend, Mark (Edgar Allan Guzman) to fake his own death. He would attend his wakes disguised as a woman to see and hear what his friends would say about him. Conflicts arise when John’s estranged sister, Mary (Dimples Romano) visited his wake. Deadma Walking has already showed us that it’s not just anothergay movie. Although it has been compared to last years MMFF entry ‘Die Beautiful’. In Deadma Walking, the main character is still alive although is dying of cancer while in Die Beautiful, the main character is already dead. It’s funny as it is dramatic, Joross Gamboa and Edgar Allan Guzman gave us a solid performances. The Film also features cameos of several big name actors, the most notable of which is Gerald Anderson, Piolo Pascual and Eugene Domingo. The film also teaches us importance of family, friendship, love and happiness. A unique and sincere portrayal of something comedic. Although the premise is presented as funny it is emotional especially since were at the subject of death, the film however made it a light wit topic,assuring us it would be enjoyable to watch, not expecting to watch such simple but great masterpiece. Both leads, Joross Gamboa and Edgar Allan Guzman despite being masculine men in real life convincingly portrayed gay characters. Both actors have already portray gay characters before therefore it is no surprise that this film is one of their best portrayal yet. The film won 2nd prize at the Carlos Palanca Memorial Awards for Literature in 2016. If your in for a roller coaster of emotions of laughing and crying, then this movie is a much for you.